When the international aid community descends on a vulnerable place, the first objective must be to do no harm. But all too often, good intentions make a bad situation even worse. That’s what happened two years ago, when United Nations peacekeepers arrived in Haiti in the wake of a devastating earthquake, bringing the deadly disease cholera with them. Last year, a panel of UN experts concluded that poor sanitation at the peacekeepers’ camp was the likely cause of a terrible cholera outbreak that has so far killed 7,000 people and sickened 500,000. Their report declined to say whether the peacekeepers, the sanitation contractor, or the UN’s own inadequate health protocols were to blame for human waste getting into Haiti’s water supply. But as cholera deaths continue, new scientific evidence removes all doubt about the source of the disease: The strain of cholera that exploded in Haiti is an exact match to the cholera that exists in Nepal, the UN peacekeepers’ native country. But foot-dragging is the wrong response. The institute’s foremost demand is not monetary compensation for cholera victims, but UN action to stop the disease from spreading; this would involve a massive investment in clean water and sanitation infrastructure. Such an effort would not just wipe out cholera, but also a host of other water-borne illnesses. Rather than merely get Haiti back to where it was before the outbreak, this effort would push the country ahead. 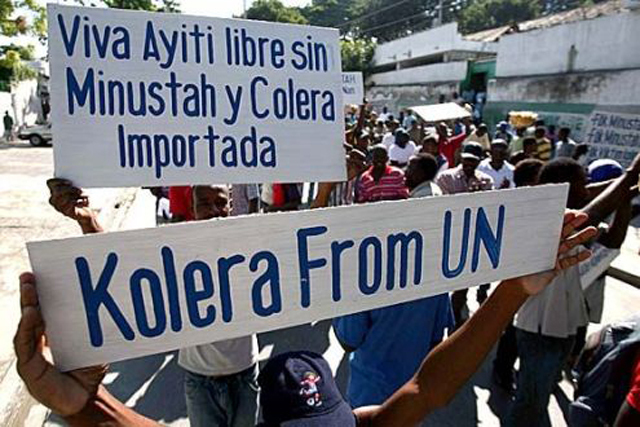 responsibility to correct its mistakes in Haiti and to institute simple public health protocols to ensure that peacekeepers who hail from cholera-infected areas never spread the disease again. 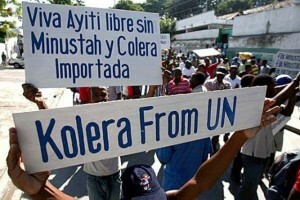 Al Jazeera: "Is the UN repackaging Haiti's cholera aid?"